Serve this warm - it's easier to slice than when piping hot. It is also delicious for the next day. Place the chicken breasts on a flat surface, smooth-side down. Slice the breasts horizontally through the middle (but not all of the way through), then open each one up like a book. Make slits in the thicker parts of the breasts. Pound them with a meat mallet and flatten to an even thickness of 6mm. Season. Divide the Mozzarella between them, in the centre of the chicken. Mix the parsley, thyme, garlic, capers and 1 tbsp oil into a bowl with a little black pepper. Spoon some of this over the Mozzarella. Roll up the chicken compactly, and secure with cocktail sticks. In a bowl, mix the breadcrumbs, parsley and Parmesan, season and add the olive oil, mixing with your hands. Pat firmly onto each chicken breast; the crumbs must stick. Chill for 30 minutes. Preheat oven to 180°C/gas 4. In a wide casserole or frying pan, heat the remaining oil. Lower in the chicken, taking care not to unstick the crumbs, and fry till a crust has formed. Turn over gently to seal the other side. (If using a frying pan, transfer to an ovenproof dish.) Add the butter and cook uncovered in the oven for 30 minutes. Take the chicken out of the oven and let it rest for 5–10 minutes. Remove the cocktail sticks; slice on the diagonal. 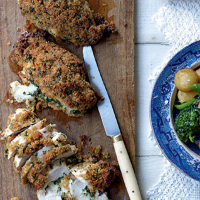 Serve with new potatoes and broccoli sautéed with garlic. This recipe was first published in June 2008.